John regularly plays live, and now offers 'non academic' GUITAR TUITION	in a relaxed and informal home studio, environment for	both	complete beginners to advanced players. 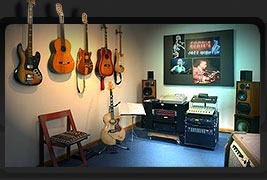 John is a highly experienced guitarist/vocalist living in Coverack near Helston. Originally from London and having performed in the capital playing all styles in different bands for many years he moved to Cornwall, playing with some of the best musicians around. Then going into music production, building and pioneering one of the first multi-track recording studios in the county, recording many albums and singles and producing for United Artists, RCA and Warner Brothers. Add to this the writing, recording and production of music for BBC TV programmes and advertising jingles. Johns plays guitar in many styles. Copyright John Knight 2018, All rights Reserved.